On our first two tutorials about Modern Project design we manage to discuss on how to design login screen and connect our project to a MySql database, now I will show you on how to Backup MySql Database through code. To backup MySql database we need to add a external application on our project which is called MySqlDump. We can use MySqlDump as it is by using a command prompt and pass several parameters like –host (server name or IP), –port (mysql Port), –user (database user name), –password (database password) , database name and we also need to specify from where we are going to save the backup by passing a filename. 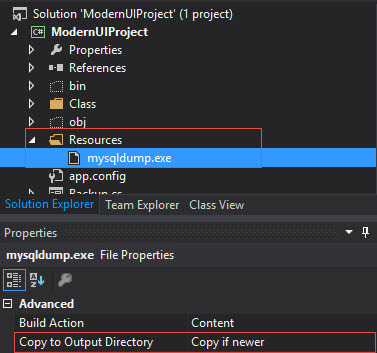 We need to add mysqldump exe file inside our Resources folder that we added on our project. And inside our code we need to create a new function call DoBackup. DoBackup function will contain all the codes that will create the batch file and executing it. On this code we are creating a batch file using StreamWriter. The batch file will execute mysqldump and pass the parameters needed to make a backup. Once we have created the batch file we now need to execute it using a Process. Once we have the DoBackup function we can just call it and pass a filename parameter. We can use SaveFileDialog to specify the save directory and filename. You can now download the file that I created on this tutorial here.